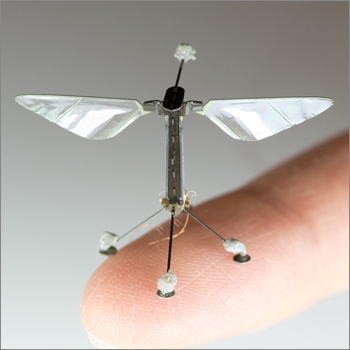 The age of small autonomous drones is upon us – with great potential for impact on many aspects of civilian life. One day soon, small drones that can maneuver complex environments while also in close proximity to people could be put to work monitoring farm crops, surveying refugee camps to assess aid efforts, and delivering goods in areas that lack road networks and transportation infrastructures. But in order to scale the use of drones up to widespread practical purposes, certain challenges concerning drone autonomy and operational regulations still need to be overcome. A new article in Nature authored by Dario Floreano, Ph.D., who is director of NCCR Robotics and the Laboratory for Intelligent Systems at EPFL and a former Wyss Institute visiting scholar, and Robert Wood, Ph.D., who is a Wyss Core Faculty member and Charles River Professor of Engineering and Applied Sciences at Harvard’s School of Engineering and Applied Sciences, discusses how drones might one day be fully capable of operating autonomously in complex, confined spaces and how legal requirements and regulations must be modified to allow for far-range civilian drone use.